Incredibly, there are a remarkable number of crazy, obsessed, foolish, bankrupt, admirable people who find working with horses all day, every day, isn’t quite enough. It is a truly a measure of a person’s dedication to an animal that, on top of what is widely considered a very demanding job, so many Grooms still choose to have their own horse(s) too. What does it take to successfully balance owning AND working with horses? How do successful Grooms do it? The biggest complaint of Grooms across the industry, as no end of Facebook threads will attest to, is the contentious subject of Work/Life balance in the equine world – or lack of it so why bother owning a horse when you work with horses? Jobs where you get to school, let alone compete your employer’s horses are few and far between and hellishly competitive to land. In many jobs, particularly those working for elite Dressage/Showjumping riders, the perks in terms of wages, accommodation and travel to all the top international shows might be high but the chances of getting to ride are low and even then it will likely be a sedate hack or to provide an equine leg stretch on an easy day. There is a whole world of difference between working with horses and owning your own. It can be nice to take a step back to just playing around with a horse with no pressure or time constraints, caring and riding for it how you want, not how you are told. There is a lot to be said for the psychological benefits of escaping out onto the nearest moorland for a nice happy hack on your day off or a sunny summers evening. Arguably, if you choose to have your own horses and make your day even longer, with spare time for friends and family virtually non existent, that is your choice. However, if you are over tired, run down , feeling unhappy and miserable because you’re never getting a moment to rest, it soon affects everyone around you. You can easily end up not giving your best to either your work or your own horse, or both! A pessimistic view of owning and working with horses some might say, but you should always be aware of the worst case scenario so you can take steps to avoid it, or at least sanity check your decisions from time to time – particularly if you don’t have the ‘right job’ to make all this a little easier! In the right job, with the right set up, good organisation and realistic ambitions it is perfectly doable. If you have a horse, one of the most important considerations for you to work out what your priorities are before you even start applying for a job. If competing your horse is the most important thing to you, ensure you take a job where this will be possible and your competition goals will not clash with your employer’s requirements. If your ambitions lay in accompanying your employer as a competition groom and multiple International stay-aways, ensure you have the cover set in place for your horse. Perhaps you are taking your next step up the career ladder to a managerial role in a bigger organisation. Are you happy for your horse to take a back step so you can concentrate 100% of your time and energy to doing the best job possible? Have you got cover in place and will doing them be the welcome relaxing downtime you need or an additional stress you haven’t got time for? All this is vital for your well being and if you are to stand any chance of building demonstrable longevity in your jobs for the health of your CV and career. In this scenario your horse is kept at your place of work, sometimes with forage/feed/bedding/stable and turnout if applicable as either part of your salary package or for a pre-agreed deduction (although, legally you must still receive at least the National Minimum Wage in addition to such extras – read more on the legalities of this here). Extra’s such as supplements/farrier/physio are usually extra or supplied by yourself. All of the horses care and exercise, within reason, is done during work time alongside the employer’s horses. Many of these employers will have excellent facilities that you would only find at the most expensive livery yards. You also will likely have the benefit of living on site with your own horse, something many of us dreamed of as a child. You need to have a clear understanding with your employer regarding what facilities, equipment and supplies (shampoo/hoof oil/flyspray etc) you are allowed to use for your own horse, including turnout paddocks and time. Ask if you need to do anything extra such as clipping and competition prep whether this should be done in your own time. When riding be considerate and don’t disappear off for a two hour jolly, or spend a whole hour schooling your own horse when you only spent 20 minutes on your employer’s horse. It can, on occasion cause ‘ruptions’ with co-workers if they don’t have their own horse or if they have to frequently spend time doing yours when you are off or away competition grooming. 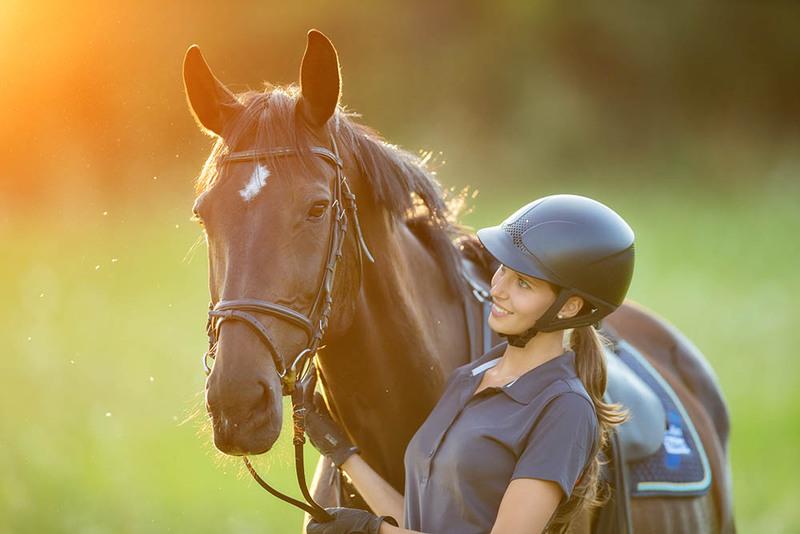 In this scenario your horse is kept at your place of work again with the same pre-agreed arrangement on salary deductions and what this includes however all the care and exercise of the horse is taken care of by yourself outside of work hours. Being able to ride and care for your horse without supervision or judgement and for however long you like without feeling pressured to hurry up and get on with other chores. Being able to play around putting into practice some of the exercises and techniques you have seen your employer use that day. If you live somewhere really remote and don’t know anyone in the area, there is not always a whole lot else to do in your free time anyway. If you work on a yard with liveries this is often when clients are around and there can be a fun, jovial atmosphere on the yard in the evening, so this can be a nice way to socialise with them. If your horse is easily stressed it can be difficult getting them to settle on a slightly different routine to all the other horses. Finding the motivation after a long day at work to then ride your own can be hard work so it tends to be your own horse that gets left unridden and after time this may be a source of discontent for you and perhaps even your horse! With limited daylight in winter if you aren’t lucky enough to have lights or an indoor arena lunchtimes become a thing of distant memory and snacking on the go becomes a new professional level skill set of yours. You are able to pick somewhere with a routine and turn out facilities/schedule that suit your horse’s needs. It can be nice to have downtime away from the yard, people you work with and liveries. Chance to explore a new area for hacking. Chance to meet new people and build a social circle outside of the workplace. Minimum disruption for your horse if he/she gets to stay put! It will in most cases be more expensive to livery elsewhere, take a good long look at your finances to ensure this is sustainable long term. Don’t forget to factor in the cost of getting to and from your horse! Depending how near a good livery yard is from your workplace, you can find adding the commute time onto your working day makes it even longer – again is this sustainable? Does your horse need to fit into a routine with other liveries? How will this work if you have an early start or late finish? It can be harder to find cover if you are away at a competition and your horse is not onsite where you can ask colleagues to do him/her for you. There is just no way of getting away from this fact – multiple horses are, more often than not, going to limit your opportunities. Put yourself in the employer’s shoes. Few are going to have the space and financial capacity to take more than one of a single employee’s horses into their own yard, particularly if it’s a commercial business as they are using the space of a paying livery/client. Family yards are unlikely to have the room as, let’s be honest, horse owners will always fill all the space available and some, rare is the yard that has too much grazing! So, say you are happy to find livery elsewhere. Firstly, how are you going to finance that on a groom’s wage? Secondly, can you blame the owner for then questioning how, working a full day for them, you plan to manage caring for 3-4 horses before and after work? It is easy to shrug this off and say, “I just get on with it” – but the reality of the matter is, when considering you against someone who can live in with little or no baggage, start the day fresh and focus all their attention on the job at hand, you are going to have to have a very good CV to compete with them. Some competition yards will let you compete alongside but their competition schedule will always come first. If you are competing alongside an amateur employer and you are competing at a higher level them take a good look at the dynamics of your working relationship and assess if this is likely to cause issues. Family yards may be less full on in terms of hours but if they have keen pony mad children it is likely that weekends will be their busiest time of the week. However week day competitions may be a negotiable option for you. Hunting yards are very busy in winter but tend to quieten down and give their staff more time off in the summer so this could be a viable option if you plan to compete intensely through the summer season – Eventing for example. Negative as this blog may seem in places, our intention would never be to discourage Groom’s from owning and working with horses. That special bond you build with an individual is after all the main reason most of us got into this job in the first place! Our aim is merely to ensure that particularly those fresh out of college and new to working full time in the equine industry or those considering a second/third horse (!) have considered how this will, practically and financially, work around a full time equine job and the various options for how this can be managed.